Much like the lifestyle-specific apps AirBnB, Zipcar and Uber, Kitchensurfing serves as an online middleman between chefs and people who want professionally cooked meals. Since the company sits nicely at the intersection of technology and food, two things that the New York Times can’t get enough of, it received a profile in the Gray Lady’s Sunday Section yesterday. 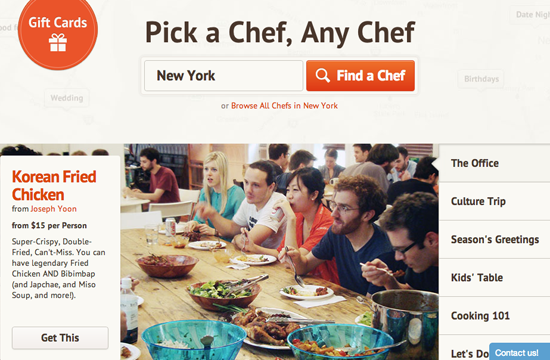 The fun part: any chef who wants to be listed on the site must “audition” for the Kitchensurfing team (in other words, cook dinner for seven), as well as both shop and clean up after themselves while on the job.